"Mr. Perfect" Is Behind Bars For Allegedly Battering Victim. Literally. A Florida Man known as “Mr. Perfect” is in jail for literally battering a female victim, police report. Cops charge that Dwayne Zimmerman, 45, was intoxicated late Friday night when he insulted the victim, who was on the porch of Zimmerman’s mobile home preparing to make pancakes for dinner. After Zimmerman flung a cooking pan, cops say, he picked up a bowl filled with pancake batter and threw it at the victim. The bowl shattered, with its contents landing in the woman’s hair and on her clothing. Batter also caked portions of the screened-in porch. Pictured at right, Zimmerman was arrested at the scene on a felony battery charge. 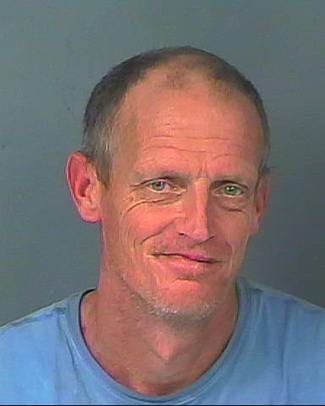 He was booked into the Hernando County jail early Saturday morning and remains locked up in lieu of $2000 bond. A judge has ordered Zimmerman to have no contact with the victim. In October 2017, Zimmerman was arrested for battery after allegedly striking his sister in the chest with a thrown gallon of ice cream. Zimmerman, who reportedly was intoxicated at the time, attacked his sibling inside his mobile home. Prosecutors subsequently declined to pursue the misdemeanor case. Zimmerman was arrested in mid-February for striking his brother in the face. The battery took place at Zimmerman’s mobile home in Brooksville, a Tampa suburb. Zimmerman, who dismissed the blow as a “little tap,” was convicted earlier this month of misdemeanor battery and was sentenced to the three days he had already served in jail and was ordered to pay $1003 in fines and court costs. Gee, What Do You Think A Guy Named Sober Was Arrested For?